- Rosie says that it was one of the artificial flowers he brought over, he put them next to a lighted candle and one of the flowers caught alight, one candle nearly burnt down all the church. - Flick resigns from Lassiters. Susan and Karl are proud that Mal put ethics in front of a fast buck, Susan says to keep working for Cuppa Diem after how they treated everyone would have been unconciable. Karl asks what Mal will do now, Mal believes he can make it again in London, Kath would not like him going back to travelling and a desk job would be to boring, he has put out some feelers and is expecting a phone call soon. Karl says they will always be there for him. Lyn asks Lou what is up, he says it has just been one of those days. Lyn says organizing the wedding has been on a par with an expedition to Everest. She says with no church and little sleep she is stressed. Joe and Flick order orange juice, Lyn a brandy to help her sleep, she needs a cure for snoring, Lou suggests a cricket ball in a sock. Lyn says sow it onto the back, Lou says no hit him over the head. Joe is interested in a carving, Susan brought it back from a trip, Joe really likes it, Flick goes to sit down, Joe follows and Lyn stays to get the drinks. 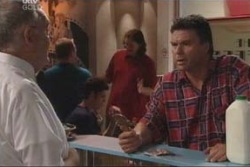 Lyn wants to know how he is going with Rosie, Lou hints at badly, Lyn hoped she would be here. Lyn is up early as Joe was snoring like a pneumatic drill at full bore, Joe thinks if he snored that loudly he would wake himself up. Lyn says if he doesn't believe her ask his daughters or the neighbours. He asks if Michelle and Flick left ok, she says Michelle went but Flick is still sleeping. Flick arrives, and says she heard them talking about her, she couldn't go as she has to cover a shift at Lassiters and Chloe Lambert doesn't think anything is important as her fabulous hospitality, Lyn says Steph will be disappointed but Flick says she will go up tomorrow and leaves to go to bed as she got no sleep thanks to Joe. Lyn cannot work out what is wrong with Flick, and she hopes she gets it out of her bonnet as she will not have Flick ruin Stephs big day. Joe thought she was really excited by the brides maid stuff, Lyn says she called her self “Chief Chick”, he says at least Steph is happy, but she wonders for how long as if he looks at the divorce figures, he says they did ok, she says even if you snore like a rhinoceros. Lou arrives and tells Harold he is going to sort out some deliveries, Harold says he should stay for breakfast and that he shouldn't still be worried about what he said last night as the report says the fire was an accident, but Lou feels he was to blame. Drew has brought Ben to say goodbye to Mal, Mal says did Susan put you up to this, Susan says it is nice for children to have cousins and has a chicken curry for Drew, and goes to change Ben. Joe greets Harold and orders, he likes Harolds carving. Harold thinks it does have a certain “Je ne cest qua”, Joe asks did Susan bring it back for you, She did, it seems she got one back for everyone, and will Flick be around today as he would like to see her, Joe asks what has she done now!? But Harold is just writing a piece for Rosie Hoylands parish news and wants to write about her brave rescue effort, Joe agrees and thinks the attention would do her good. Lyn says she shouldn't be eating this, Joe asks why women always say that when eating, she says fashion designers think they should be a size 10. Joe wants to invite the Kennedys over for a drink to welcome Susan back from New Zealand. 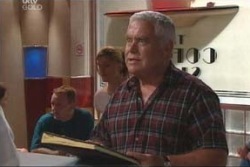 Flick answers the door to Harold, he wants to do an article on her saving the minister, but she thinks it is nothing. Harold says it took a lot of bravery to go into that burning building. But Flick is not to keen to be a role model. Flick does not think she is that inspiring, but Lyn thinks that she should have her photo taken, Harold thinks her modesty is very good and takes her photo. Harold serves Mal, he has already ordered but Harold will bring it over. Lou arrives and wants to know why Harold wanted to see him, Harold thinks that they could get Rosie's photos repaired and put them in the album it would be a gesture from the both of them, Lou likes the idea and has the photos in his safe. Harold serves Mal, who has seen the coffee logo somewhere before, Harold says it is not original as the Irish have been doing it for years, Mal says a good idea is worth stealing. Drew answers the phone to Libby and tries to explain that Ben is ok, and he is capable of looking after Ben, before going back to feed Ben. Mal explains that Harold has forgiven him, he also thinks Harold should steal some ideas from the “Cuppa Diem Bible”, as he already has. Mal wants to sue Cuppa Diem for loss of income ect but Susan and Karl think it is a bad idea as they are a big company, Mal says it is a matter of principal and that they do not need to worry as he is a husband and has responsibilities and hopes he can do as well as they did. They say good bye and hug each other, Mal agrees to call him when he gets there. Susan looks through a window as Karl helps Mal pack the taxi, as Mal leaves Karl encourages him to keep in contact in anyway and if he doesn't he will turn up on his doorstep. 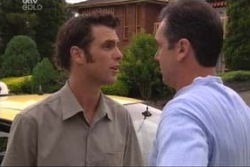 As Mal leaves he gets Karl to look after his house and find an agent. Karl and Susan noisily arrive with curry for Drew, who tries to make them quite as he has just put Ben to bed, and asks if Mal was ok. But not before leaving problems behind, he wants Karl to sell the “Hancock House”. Ben starts crying and Drew convinces Susan that he can look after Ben and sometimes it is nice to play dad, Susan and Karl leave for the Scullys. Joe and Lyn are rushing about, he answers the phone to someone who wants to know where Flick is, he says at work but it is Lassiters who were wondering where she is, Joe agrees to tell Flick and hangs up. Lyn asks Joe what is up, he says Flick was meant to collect her pay today and return her uniform as she doesn't work there. 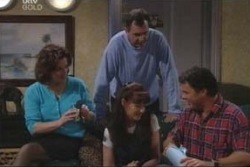 Karl and Susan argue over giving Drew some space to take care for Ben, he says they cannot become the dreaded in-laws always on the door step, then knocks on the door. Joe greets Susan with a huge hug. Susan has got Lyn some earrings and Joe a steering wheel cover for his taxi, before going to get drinks. Flick arrives, and goes to the kitchen to talk to Lyn. Lyn says she did not have a shift, she does not even have a job as she was meant to collect her pay and return her uniform. She wants to know if Flick was sacked or quit but flick will not tell her. Lou arrives, he wants some company, Drew does not mind as they were just watching a bad movie, he explains how Susan and Karl are overdoing the fathering advice. Lou has seen the film before it is a “Pommie” movie with what's his name. Lyn is moving to escape the noise Joe is making and makes a bed on the sofa, but she can still hear Joe. Flick arrives home, she went out clubbing. Lyn starts screaming at Flick about the amount of time she is spending out and them not knowing what she is doing. Flick says she is going to the states with Tad next week, Lyn asks if she has a job or visas sorted and Flick is just jealous and she should snap out of it, as she had a crush on Mark and it can be painful but at 18 she should be able to put that behind her, and this is Stephs turn in the limelight and Flick seems determined to ruin it for her. Flick thinks it is unfair but Lyn doesn't agree and thinks she should take a long hard look at her self and no one will spoil Stephs happiness not even Flick.